You can find several several sailings to top Holland America Eastern Caribbean Ports of Call - if you are looking to sail east. Holland America Cruises offer several extended cruise sailings (7 days or more) to the Eastern Caribbean. I can guarantee that your family will find the ideal Holland America cruise heading to several appealing and exciting ports in the Eastern Caribbean. 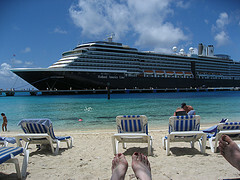 If you are not familiar with a Holland America cruise, someone describes it as "not a party cruise line". That may be true. When compared to Carnival Cruises "Funships" or Norwegian Cruise Line's "Freestyle Cruising", Holland America is more a traditional type of cruise line. In fact, many people agree that Holland America caters more to an older crowd. However, Holland America has taken steps to offer an appealing family Caribbean cruise package to younger families. The cruise line now offers "hipper" things such as Internet cafes with wireless access, indoor-outdoor pools for year-round use and of course Club HAL. This is a kids' program geared towards entertaining and involving children from 3 to 17. Holland America continues to expand its Club HAL program such as lounges dedicated to teens and gaming rooms. Most people agree that Holland America cruises are good bet. Your family will be delighted to find an affordable inclusive family vacation aboard one of Holland America's amazing Caribbean cruise liners largely from the Ft. Lauderdale Cruise Terminal in Florida. Additionally, your family will enjoy top Holland America Eastern Caribbean ports of call on each trip. Think “Puerto Rico”, “Turks & Caicos Islands”, “Falmouth”,“St. Thomas”, St. Maarten, Netherland Antilles” and much more. Enough talk! Let us look at which Holland America Eastern Caribbean Port sailings are really available. As you can tell, Holland America offer several inclusive Caribbean cruise package deals to the Eastern Caribbean. I have only listed some. There are several other longer cruise sailings - as long as a 35 day cruise! 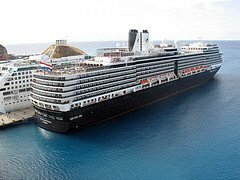 If you choose to sail with HAL, you will find two U.S. departure ports to choose from, different sizes Holland America ships and many Eastern Caribbean ports of call to visit. We believe that your family will find a suitable and enjoyable inclusive cruise vacation package to one of several top Holland America Eastern Caribbean Ports of Call.